CSA AUTUMN SHARE WEEK #9 The eggplant and capsicums were composted last week and we have harvested the last of the sweet corn (which Friday members received last week). With winter upon us, our warm weather crops have finished. NOTES ON WHAT'S GROWING The cold seems to have settled in, even though we have been lucky with some sunshine the past few days! Peter and I walked through the remaining crops over the weekend and talked about the slowed growth due to lack of sunlight. The final planting of mixed greens may not be ready for the last week of our CSA...just three more weeks to go! There is more kale, silver beet, rocket, spinach and hopefully lettuce still to come. We also grew Brussel Sprouts this year for the first time. These plants were hit early on by aphids but are still growing and we are hoping to be able to harvest these once a true frost has sweetened them. We have had a light frost which killed the tops of a late season basil crop experiment. We harvested our first head of Romanesco broccoli this week too. With its incredible fractal spirals and great green colour, this is a wonderful winter crop. The importance of light is one of the big differences between biodynamically grown food and organically grown food. Organically grown food may still be grown with nitrogen boosting "fertilisers" - even though these will come in the form of a natural product. In biodynamics, manure may be applied to fields but this is usually done before the green manure crop is sown. When the green manure is tilled in, the goal is for the digestive powers of the earth, which include soil microbia, to convert the inherent proteins of the grass itself into the hummus layer in the soil. Plants then use extensive root systems to tap into this hummus layer to feed themselves and they also rely heavily on sunlight which is converted through photosynthesis into plant energy. If the plant itself is fed through fertilisers, it may not make an extensive root system or need to use as much sunlight to grow - the nitrogen will force feed the plant. Our days are continuing to shorten as we head towards the Winter Solstice. The sun today though is still warm and wonderful! RECIPE SUGGESTIONS Roasted Cauliflower Cauliflower Gratin - from Martha Stewart Spicy Roasted Parsnip Soup Warm Kale and Roasted Pumpkin Salad Heidi's Winter Pasta Cauliflower Casserole with CheddarYou can search our recipes by looking for the key ingredients on our website recipe pagePlease note - Photo is a randomly selected full share box with the inclusion of a whole pumpkin (the full shares received about a 3k piece). The sun for three days was a welcome change to the wind, rain and hail of last week! In sorting through photos of last season, late Autumn this year has been colder and wetter. This has really slowed down the growth of some of the root crops - we were expecting Japanese turnips for everyone but there are still many little ones in the field. Many of the green manure crops sown in the past three weeks have germinated and are growing. Next season’s garlic has also shot up! The lull in broccoli has begun this week. The last planting of the season is starting to develop heads. And we were able to harvest quite a few side shoots from the first three plantings. But the main heads from these plantings are done. Broccoli will be a rotated item until the last planting comes on. The cauliflower harvest continues with the purple heads almost ready for harvest. We did a late lettuce planting which we have protected from hail and frost with row covers. The heads are small, due to the lack of sunlight. But we should have some on Friday and maybe next week too. The snow peas are full of flowers and still growing. We hope they continue! We have another planting of peas in the ground but with the early cold this season, we are unsure if they are going to go dormant for winter and then flower in early Spring! We were able to do another application of biodynamic 500 tonight and hope to have the chance to do 501 in the next few days. 501 helps plants make the most use of the limited light at this time of year...we are approaching 9 hours of sunlight a day! 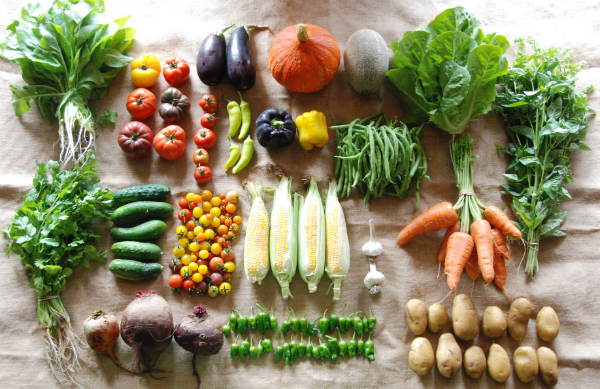 Most vegetables need 10 to actively grow. Farm pickup is 2-5pm Fridays and 8-11am Saturdays. Box pickup is available at other times by appointment only. If you are running late, please do ring to avoid disappointment.NOTES ON STORING THE HARVEST Please check out our Vegetable & Fruit page on the website to find tips on maximizing the life of your veggies. We envisage that many of the vegetables you are receiving this week will last for two weeks with careful attention to storing upon arrival. Although we do wash all the greens after harvest, we are washing to take the heat out of the plants and wash away some surface dirt, not to prepare them for consumption. We also spray a seaweed/herb brew about every ten days. While this will not harm you, it does have a taste. We do suggest washing your produce prior to eating. Happy Late Autumn! The storage crops are all harvested and the first storm of the Winter season is raging outside - gale force winds, heavy rains and hail! With tender late season greens tucked under row covers, and the harvest for the deliveries completed yesterday, we can spend the day in the office - catching up on newsletters and bookwork. The lovely Dylan and Priya from Palate came down to the farm and made a couple of short movies (click on the photos) a few weeks back now. We think that the photography is pretty awesome and the movies give a great insight into how and why we farm the way we do - if you are interested to watch we hope that you enjoy. Thank you Dylan and Priya! Conversations in the field can be quite varied...and sometimes can become passionate discussions. This week the lovely Belinda, who has worked with us this season, and Trent, our Autumn intern, attended the screening of the Fair Food documentary and discussion afterwards in Melbourne. We have many ideas about what Fair Food means...two of them being localizing the food system...as here in Australia 80% of the food choices are controlled by major corporations... and directly supporting those who are keen to grow great food in an ethical and ecologically supportive way. We would like to see more small scale farms in Australia and would love to spread the word that farming for the local community can be financially viable. If you feel inclined to share the video to spread the word, please do! We are racing the sun to get the last of the winter green manure crops in the ground. We have lots of things to share over the late Autumn and Winter about our season and our plans for the next, so more news to come. To see more photos of the farm and our farming, please check our instagram accounts - transitonfarm and transitionfarm_robin. CSA AUTUMN SHARE WEEK #4We are sad to say that this is the last week of tomatoes. The cold, wet weather we have had and the light frosts of the past week have finished the tomato and cucumber season. We have row covers on the beans so we hope to have more next week but this is the last planting for the season. We have one final corn planting which is still to ripen. The zucchini are finishing as well. The boxes will look much more Autumn-y now. We have spent the week clearing out huge sections of the farm and preparing them for green manure crops. We sow a mixture of grasses, clovers, vetch and legumes. These protect the soil through the winter, keeping the nutrients from leaching out and providing habitat for soil microbea. In the Spring, they grow high and produce a great biomass which we incorporate back into the soil. This becomes the hummus layer that our crops feed from throughout the growing season. There is still the last corn planting standing tall. Once the tomatoes are removed, most of our tall summer crops will be removed. It has been cold, windy and raining this week. We have had hail as well as heavy rains. The brassicas are all still standing! We have planted more lettuce seedlings and have them protected with row covers. We also have a mesclun planting that is growing well. If the sun continues, it may be ready next week. If not, the following. There is more bokchoy coming and fennel. Spinach and Feta Pie - A Jamie Oliver recipe that is easy to make, travels well and liked by our farm crew and children. Pasta with Broccoli and a Lemon Basil Sauce Jamie Oliver's Beef Stew - If you still have turnips left over from last week and you are a meat eater, this is a wonderful slow cooked stew. 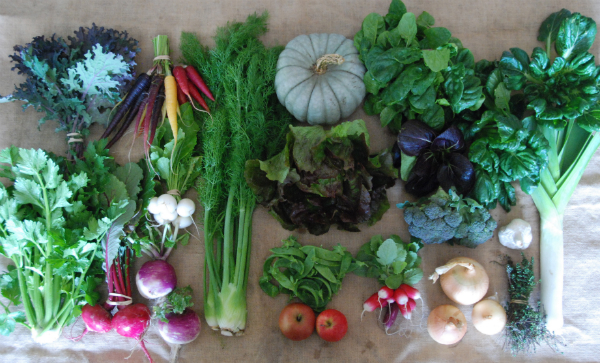 CSA AUTUMN SHARE WEEK #3 Our What's in the Box photo helper has returned to school. These are the last weeks of tomatoes until December! We hope you are enjoying them as much as we are!! The farm had its first light frost on Sunday night. Peter turned irrigation on at 4am to protect the frost sensitive crops...sweet potato, beans, zucchini, cucumber, tomatoes, capsicum, eggplant and lettuce. All fared well but there is a natural resignation to the cold, damp nights in the zucchini, cucumber and tomato. The capsicum and eggplant are slowing down considerably with the cold. We are currently picking the last bean planting. And we hope that the last sweet corn planting will ripen in the next few weeks. Enjoy these crops now as we will not see them again until next December. Meanwhile the cool loving crops are thriving. 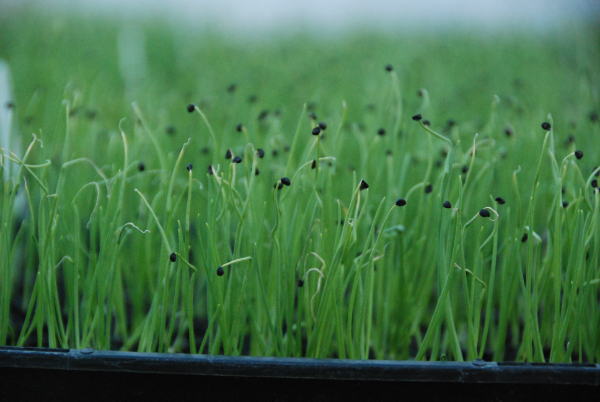 The next broccoli planting should be ready for its first harvest on Friday. It is a big planting with many heads looking like they will be ready at the same time. This might mean lots of broccoli all at once. The first cauliflower planting is starting to head. The root crops are glowing. We have harvested the pumpkin crop and are curing them for long storage. This week you will receive ‘Butternut’. Your fruit may have damaged skin. The inside is fine though. We use these first as they do not store. We planted the garlic crop for next season this week and now know what we have left for the rest of the season. The storage onions are also drying and plentiful. Onions are one of the most heavily sprayed crops and because they bulb on top of the ground the spray residue is very high in the onion. Enjoy these unsprayed, biodynamic onions which should store in a cool dark place for months. The cherry tomato crop is still producing for “Pick Your Own” during farm pick up times...with the threat of frost and the crops natural waning, get them NOW. Please bring your own containers. Limit a 1 kilo bucket per family. Please note - Photo is a randomly selected full share box with the inclusion of coriander which missed the photo. CSA SUMMER SHARE WEEK #12 The last week of the Summer Share...Thank you for your support of our farm and growing endeavours. You have been a vital part of our continued desire to grow nutrient dense food for our community in a sustainable way. 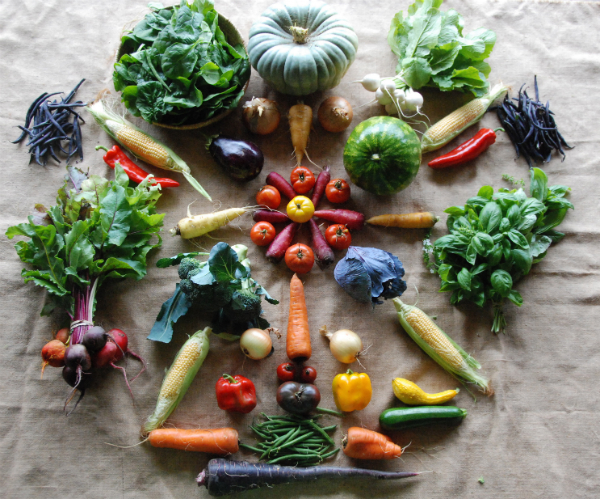 We look forward to the next 12 weeks of our CSA season. NOTES ON WHAT'S GROWING Tahlia Gregori, the intern that has been working with us for the past three months leaves next week. She has been a fantastic intern and we wish her the best in her growing endeavours! We have started harvesting the first of the Autumn broccoli crops. If you did not receive any this week, you will next! All of the brassicas love the cool nights we have been having and the rain has been welcome, too. We have also started harvesting our third zucchini planting. We hope that it will be able to ward off powdery mildew and keep growing until the frost. The next corn planting will be ready next week. The sweet capsicums are still coming on. If you are receiving more than you know what to do with, you can slice them and freeze them to use in stir-fries and sauces through the winter! We will have lettuce this week and next and then there will be a gap in the head lettuce. We have planted many other greens so that this gap will hopefully not be felt in the boxes. The lettuce seed does not like to germinate when it is hot. We do several things to work around this but had three weeks of lettuce not germinate in the glasshouse. The current lettuce seedlings are doing well but not even in the ground yet. All of the Autumn brassicas are glowing and the parsnips and turnips are growing well. 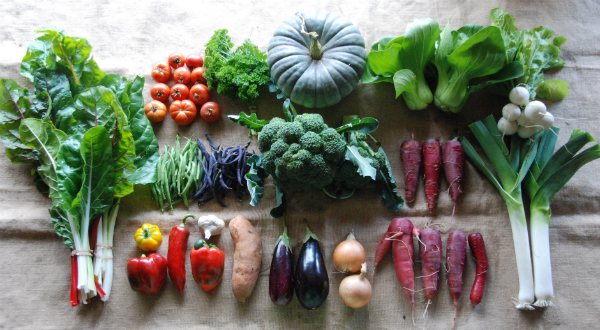 The transition into Autumn is always softened by the great flush of Summer vegetables still enjoying the warm soil. The bean picking Tuesday was not as heavy as summer weeks. There will be more beans next week. The tomatoes are starting to succumb to summer disease. We are still picking though! The cherry tomato crop is still producing for “Pick Your Own” during farm pick up times! Please bring your own containers. Limit a 1 kilo bucket per family. CSA SUMMER SHARE WEEK #11 We started harvesting the leeks this week! Perfect soup weather with the nights cooling down and the coming of the Autumn equinox. In France the 'Galeux d'Eysines' pumpkin is mostly used for soups, sauces and preserves such as pumpkin butter because the texture of the cooked fruit is very smooth. One of the tastiest pumpkins! NOTES ON WHAT'S GROWING The next plantings of sweet corn and beans are not ready for harvest yet. The broccoli is heading up...unsure if it will be ready for next week but definitely the following. The red cabbage is forming heads as well - Enter the Autumn brassicas! The third zucchini planting has many small fruit so we hope to able to start harvesting zucchini again next week. Amidst tending the brassicas, curing sweet potatoes (sweet potatoes cured for a few weeks are sweeter then those straight from the ground! ), harvesting all the potatoes and storing onions and seeding more greens and roots for Autumn, we are preparing areas of the farm for the green manure crops we LOVE! These crops make a winter blanket, protecting the soil from the wind and rain of winter while providing all of the soil microbes roots to continue to feed on. Then in Spring, they become the soil’s salad - a mixture of nutrient rich grasses, legumes and herbs which build the humus layer in the soil and feed the plants throughout the season. It is wonderful to watch the farm slowly transition from tired crops, to bare soil, to sprouting green growth. Peter and I have been taking lots of pictures of the farm and posting them on instagram. There are small thumbnails on our website home page. You can click on these to see them bigger. The cherry tomato crop is still producing for U-picking during farm pick up times! Late summer is a great time to see the farm with late blooming sunflower rows, 2m high corn stalks, Autumn brassicas, beans, Autumn peas germinating, the pumpkins ripening, chickens in the buckwheat green manure crop...It looks fantastic and abundant! Please bring your own containers. Limit a 1 kilo bucket per family. Farm pickup is 2-5pm Fridays and 8-11am Saturdays. Box pickup is available at other times by appointment only. U-pick is only available during farm pick up times. PASTA WITH SWEET CAPSICUMS I find that sometimes the simplest of recipes allow each ingredient to be savoured. Ingredients 2 sweet capsicums sliced thinly into strips 2 cloves of garlic olive oil fresh basil leaves, ripped roughly salt and freshly ground black pepper Shaved Parmesian cheese Pasta of your choice (penne, bowties and angel hair really hold the flavours of this sauce) Method 1. Prepare pasta according to instructions 2. Put a generous jug of olive oil into a fry pan over moderate heat. 3. Add crushed garlic and sliced capsicums. Fry until the capsicum is soft and slightly carmelised. 4. Add to pasta with fresh basil, salt and ground pepper and parmesian cheese. Please note - Photo is a randomly selected full share box except fot the whole pumpkin (full shares received 1/4). CSA SUMMER SHARE WEEK #10This is the time of year of making big compost piles and planning the green manure crops for winter. And then there is the huge harvests still to come of storage onions, sweet potatoes, potatoes and pumpkin. The weekly harvests and plantings for the Autumn share and there is still plenty of weeding to keep us busy! We have had several members let us know how the box is working for them and send through recipes that they have enjoyed. We really appreciate the feedback (as we start planning for next season in April) and the tested recipes are a great addition to our newsletter! Please email or talk to us on the farm. We really do want to know what you are enjoying and what you find more challenging to work with. NOTES ON WHAT'S GROWING We have been bringing in parasitic wasps to combat the many caterpillars in the crops at this time of year. Even though they work on the eggs of the corn borers, you may still find the caterpillars in the tops of your corn. Although they can make a mess, it is usually pretty simple to just cut off the top and have the rest of the untouched ear for yourself! The cherry tomato crop is open for U-picking during farm pick up times! Late summer is a great time to see the farm with late blooming sunflower rows, 2m high corn stalks, Autumn brassicas, beans, Autumn peas germinating, the pumpkins ripening, chickens in the buckwheat green manure crop...It looks fantastic and abundant! Please bring your own containers. Limit a 1 kilo bucket per family. Our third zucchini crop is flowering. We hope that the cooler nights still allow the fruit to set so that we can keep having it for another month! Although the tomatoes have slowed a bit with the cooler nights, the plants are still healthy and producing. The second cucumber planting is succumbing to powdery mildew so there is quite a reduction in cucumbers this week. It is hard to say how long the planting will continue for. The third planting was really hit by the winds last week and although it has begun to flower, we are unsure if it will bear fruit. We welcomed a new intern to the farm last week! Sapote Hudd heralds from NSW. She will be with us through Autumn. Please note - Photo is a randomly selected full share box except fot the whole pumpkin (full shares received 1/3). CSA SUMMER SHARE WEEK #9We will open the cherry tomato crop up to U-picking! This is the last week we will harvest cherry tomatoes for the boxes as the crop will be available for you to U-pick during farm pick up times. Late summer is a great time to see the farm with late blooming sunflower rows, 2m high corn stalks, Autumn brassicas, beans, Autumn peas germinating, the pumpkins ripening, chickens in the buckwheat green manure crop...It looks fantastic and abundant! Please bring your own containers. Limit a 1 kilo bucket per family. NOTES ON WHAT'S GROWING Our first zucchini crop which has been producing since November succumbed to powdery mildew. The second crop is as well. We have a third crop planted but it has not yet started producing so there may be a few weeks of no zucchini. The cooler nights and heavy evening dews do bring powdery mildew. The cooler January did not help with this. We are seeing the mildew in the melons, cucumbers and zucchini crops. The beans are still going strong as is the sweet corn. And we have begun harvesting pumpkins! This week there are Pottimon and Butternuts. The larger pumpkins are still ripening in the field. We also had a look at the sweet potato crop. We will begin harvesting those in about two weeks and then cure them to allow the sugars to fully sweeten. The leeks are looking great! And there are plenty of carrots. The storage onions are beginning to dry and we have parsnips and turnips growing. The first of the Autumn broccoli crops looks to be a few weeks away from harvest. And the Autumn peas have been planted! We will be sending a letter in the next week to confirm your interest in the Autumn Share which starts in April and goes through until June. This fantastic Thai green curry recipe features eggplant and red pepper (carrots make a great substitute if these are not in season). You can add cauliflower, zucchini, beans…really any other stir fry vegetables you have in the fridge. The homemade green curry paste is what makes this dish such a lovely combination of distinct flavours, so don’t be tempted to substitute the store-bought variety. Top the curry with fresh basil. 1. Place all ‘Green Curry Paste’ ingredients together in a food processor, blender, chopper, or pestle & mortar. Add up to 1/4 can of the coconut milk, enough to help blend ingredients (reserve the rest for later). Process (or pound) well to create an aromatic Thai green curry paste. If you don’t have a food processor or chopper: try using a blender, or finely mince all ingredients by hand and stir together well. 2. Heat a wok or deep frying pan over medium-high heat. Add 2-3 Tbsp. oil and swirl around, then add the green curry paste. Stir-fry briefly to release the fragrance (1 minute), then add the vegetables which take the longest to cook like carrots and cauliflower. Stir for 2 minutes coating with spices. 3. Add the stock and bring to a boil. Stir and reduce heat to medium or medium-low. Simmer 6-10 minutes (until the carrots start to tender). 4. Set aside 1/4 cup coconut milk, reserving it for use later (the thick cream is best). Add the rest of the coconut milk to the curry, plus the eggplant and beans (if using). Stir everything together, cover, and simmer another 7-8 minutes, or until eggplant is tender enough to pierce with a fork. 5. Add the bell pepper. Cover and simmer another 2-3 minutes, or until everything is well cooked. 6. Remove from heat and gently stir in the 1/4 cup reserved coconut milk. Taste-test, adding more fish sauce if not salty or flavorful enough. Add more lime juice if too salty or sweet for your taste. Add more sugar if not sweet enough. More chili can also be added. 7. Serve with a generous amount of fresh basil and or more coriander. This is a quick recipe (10 minute) that we make alot for farm lunches. 1. I use a food processor to grate the beetroot and carrot. 2. In a bowl, crumble the feta. Add oil, vinegar, salt and pepper and coriander. 3. Add beetroot and carrot and mix roughly. Serve over lettuce or as a side. ...if you find that your fridge is starting to stockpile old veggies, Make Soup! I have been told that every region in Italy has its own ministrone. Keep that in mind when you are making this, substituting and adding anything you feel works. I have written the straight recipe from Slow Cooking by Joanne Glynn. 1. Put the borlotti beans in a large bowl, cover with cold water and leave to soak overnight. 2 Next morning, drain and rinse thoroughly under water. 3. Melt butter in a large saucepan and add the onion, garlic, parsley, sage and pancetta. Cook over a low heat, stirring once or twice, for about 10 minutes, or until the onion is soft and golden. 4. Add the celery, carrot and potatoes and cook for 5 minutes. Stir in the tomato paste, tomatoes, basil, and borlotti beans. Season with plenty of freshly ground pepper. 5. Add stock and bring slowly to a boil. Cover and leave to simmer for 2 hours stirring once or twice. 6. If the potatoes have not broken up, roughly break them up with a fork against the side of the pan. Taste for seasoning and add zucchini, peas, beans, cabbage and pasta. Simmer until the pasta is al dente. 7. Serve with a dollup of pesto and Parmesan. 1. Preheat oven to 200C/180C fan-forced. Line a large baking tray with baking paper. Remove and discard seeds from pumpkin. Cut pumpkin into 4cm thick wedges. Combine oil, cumin, ground coriander, cinnamon and ginger in a large bowl. Season with salt and pepper. Add pumpkin. Toss and rub to coat. 2. Place pumpkin in a single layer, on prepared tray. Roast for 25 minutes. Turn pumpkin. Roast for a further 10 minutes or until tender. Please note - Photo is a randomly selected full share box except for the whole pumpkin (it depended on the size). CSA SUMMER SHARE WEEK #8 In addition to a very full harvest day, we did an application of Biodynamic 500 last night and Biodynamic 501 this morning. Back to back applications of bd500 and bd501 can help invigorate plants at the end of their growing cycle. We are hoping this helps them to ward off insect attacks.There may be caterpillars in the corn. This is un-sprayed corn and the caterpillars like it as much as we do. They are usually only in the top of the ear. You can simply cut that off and enjoy the rest. I was happy to see that the capsicums are starting to turn red and yellow - sweet capsicums are on the way! The fruit have been on the plants for a long time waiting to turn. Some have been sunburned, others eaten by caterpillars. There are still lots of capsicums there - and some are huge. Seeing them changing colour is exciting. Pumpkins - we will start to harvest a few varieties of pumpkin next week. And the first crop of Autumn broccoli looks only about two to three weeks away from harvest. The long sunsets are a sign that the seasons are changing and seasonal eating is too.